Preparing an athlete for training base-level requirements. Choosing correct exercise, and technique. Choosing correct intensity and progression of intensity. The coupling phase is the definitive phase of plyometric training. The lesser the transition phase between eccentric stretch to isometric to concentric contraction, the greater is the benefits of stretch-shortening cycle. Many studies have shown the decrement of stored elastic energy in coupling phase lasting longer than 25 ms. The ideal coupling time is less than 15 ms. The quality of impact force is important. It is important to have a high muscular activation during the eccentric phase of a stretch-shortening cycle for efficient storage of elastic energy, especially in the tendon (P. Komi, 2003). Progressing jump heights that the athletes jump up to or down from is more effective than the added weights during jump training. 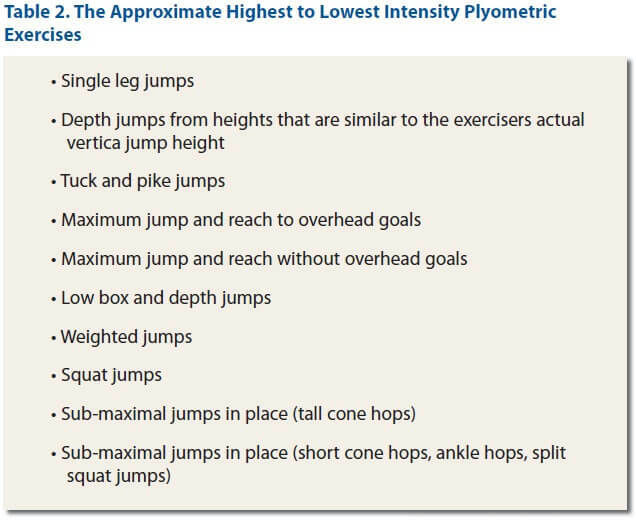 As added weights limit the quality and jump heights, plyometrics will be moderately intense. Jumps performed with target reach (eg. Basketball rim) are more effective in improving jump height than without a target. Thus, target jump height is more intense than jumps without a target. Any form of single leg plyometric is more intense than same form of double leg exercise. Jumps in place like pike jump or tuck jump have higher joint reaction force at the knee joint than other forms of jumps like depth jumps. 2 – 3 sessions per week without any symptoms. As in other forms of exercises, the intensity of plyometric training depends upon the athletes need and capacity. There should be a gradual progression from low to high-intensity training. The intensity of the training can be manipulated by changing various components of exercise at a time. Some studies have reported 80 – 100-foot contacts per session for beginners, 100 – 120 contacts for athletes with some experience and 120-140 contacts for athletes with considerable experience. However, there are some studies which have proved higher contacts for low-intensity plyometrics is necessary. They have suggested up to 400 contacts for low intensity, 350 contacts for moderate, 300 contacts for high intensity and 200 contacts for very high-intensity plyometric exercises. Thus, clinical experience and the capability of the athlete is the key component to choose from either of the intensity protocol. 6-8 weeks. Less than 5 weeks is too short period. A work-rest period of 1:5 to 1:10 has been recommended for high-intensity plyometrics to ensure the safety and effective performance of exercise technique. So, at least 5 to 10 seconds of rest is important following a maximal effort vertical jump before attempting another jump. A 1:1 or 1:2 work-rest ratio is suitable for low to moderated intensity plyometric training. A general recommendation is 48 to 72 hours of rest period between the plyometric training sessions to ensure effective training, reduce the risk of DOMS and other injuries. Proper exercise technique is the key component of plyometric training. A 3 -4 sets of plyometric training with 2 – 8 repetitions of one type of exercise has been advocated as the most effective training volume for a high-intensity plyometric session. FC = Number of foot contacts per session.